Century 21. We’re in it. But only 50 years ago, it felt like a lifetime away—an expanse of time traversed by the brave and the adventurous. Century 21. Only 50 years ago, it was the name of the World’s Fair, hosted by Seattle. It explored the past, the present and most notably, the future. Roughly 10 million attendees toured the themes of space, science and the future, unaware that they were creating it, giving Seattle a lasting legacy. It’s a celebration that’s been around longer than the United States Declaration of Independence—the inaugural fair was hosted by London in 1756. From carnival rides, museums and speeches by notable political figures, to food of the world, it’s an homage to bounty; a representation of the best this world has to offer. 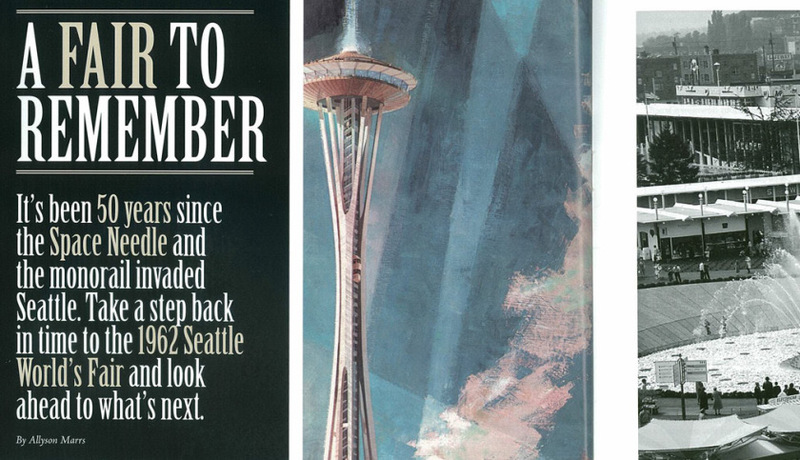 April 21, 1962, marked the beginning of Century 21, which would run exactly six months, closing its doors on October 21, but leaving Seattle with two icons: the Space Needle and the monorail. Seattle was merely a passing thought before the fair propelled it to recognition. Initial competition from New York, and Boeing’s general disinterest in the whole thing, nearly derailed the event, but eventually, Boeing couldn’t resist the opportunity to be a part of a science exposition. The monorail was a means to transport the thousands of daily visitors from the fair to the various downtown amenities. Its construction began one year before the opening of the fair and opened to the public on March 24, 1962. Its construction cost $3.5 million and was sold to the City of Seattle from Century 21 Corporation in 1965 for $600,000. To this day, it’s the nation’s only fully self-sufficient public transit system. Both brought the space-age theme to life, a theme that was originally set to be “American West,” and helped propel the United States’ vision of assuring the world that we were in no way behind the Soviet Union in terms of visionary developments. Just to be sure, the Baltic States didn’t receive an invite to the affair; neither did the People’s Republic of China, North Vietnam nor North Korea. During the festival, visitors could spin in a circle and face a new attraction in each turn. Perhaps the favorite attraction was the Gayway, a small amusement park, which Katy says was the highlight for any 10-year-old. But some of the attractions were also educational. “Century 21—The Threshold and the Threat,” or the “World of Tomorrow” exhibit was hosted by Washington state, boasting a tour of the future. Riders embarked on futuristic pods for a journey into space. They faced images recounting history, from iconic structures in Greece to the iconic body of Marilyn Monroe, but mushroom clouds and desperate families hiding in fallout shelters also made an appearance. Pan American World and General Motors, among others, sponsored the other exhibits. Boulevards of the World offered immense shopping excursions, and the Food Circus tantalized with exotic bites. “My absolute favorite were the Belgium waffles—fluffy, warm and covered with whipped cream, fresh strawberries and powdered sugar,” Katy remembered. Fair personnel donned attire fit for the occasion, keeping the theme intact with even the smallest details. “So many of the workers wore futuristic costumes. You felt like you were in the Jetsons cartoon,” Katy said. The revolving restaurant was also a hit amongst visitors, which creator Eddie Carlson was especially proud of. Katy and her family took to placing objects around the windowsills, waiting for the rotation to bring them back. The whole affair created a phenomenon in the once-unknown city. So what would an anniversary of a World’s fair be without an equally boisterous celebration? Seattle has put together an organization especially for this momentous occasion. The Next Fifty will be kicking off a series of events and exhibits this month that will run the same span as the fair 50 years ago. With a mission to highlight the leadership and innovation in the area during the last 50 years, the organization will focus on eight specific aspects—from culture and history, to technology and sustainability, among others. Various projects will aim to educate and inspire the Pacific Northwest family. To fully immerse yourself in the history of the fair, The Next Fifty is offering both a walking tour and an exhibit. The tour will take guests through the cultural, architectural and historical remnants that the fair imprinted on the city, offered four days each month from April 26 to Oct. 20. The exhibit, “Celebrating Century 21,” will display objects from the original fair along with pieces from the Hagley Museum and Museum of History and Industry. The exhibit will be open from April 21 to Oct. 21 at the Seattle Center. For a full list of the many events put on by The Next Fifty, as well as more information about their programs and focus areas in commemoration of the fair, visit the website, thenextfifty.org. Fifty years ago, the Seattle World’s Fair put our fair city on the map and in the minds of millions. Not only did it honor looking forward, the fair helped push the city ahead of top contenders in the arts and sciences. Just like then, six months will be set aside, starting now, to remember the past while planning for the future. There’s fun to be had and creating to be done. It’s about remembering the events that brought Seattle to where it is now—about honoring our home.